I have been a lot of places and done a lot of things. After all, I am 77 years old. Besides turning my hand to writing of my hiking adventures of completing the Triple Crown, I have been in the Peace Corps, a Physical Therapist with a specialty in Pediatrics, an Army wife, a Pastor of a church for 16 years, a gardener and retired. I am the mother of two and grandmother of 10. (the outdoor grandma) In my spare time I preach and play the cornet. Impressive is an understatement for Mary’s achievements. Completing any of the National Scenic Trails in the U.S. is remarkable, completing the Pacific Crest Trail (2,650 miles, the Appalachian Trail (2,181), and the Continental Divide Trail (3,100) is over-the-top amazing. Mary Davison started hiking the Pacific Crest Trail in 2003 and the Appalachian Trail in 2004. Year after year, she returned to hike new sections of these trails. 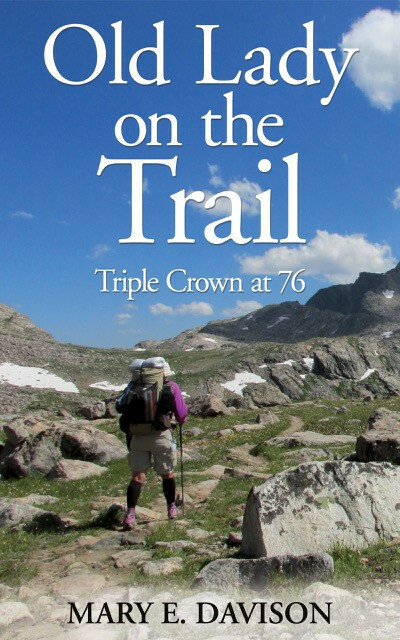 In 2011 she finished the Appalachian Trail and in 2012 the Pacific Crest Trail. In 2012, she began section-hiking the Continental Divide. In 2017, at the age of 76, she hiked the miles remaining to complete all three. Susan ‘backpack45’ Alcorn, author of Healing Miles: Gifts from the Caminos Norte and Primitivo and We’re in the Mountains Not over the Hill: Tales and Tips from Seasoned Women Backpackers.